Vitamin D deficiency can be considered as one of the common health conditions that people in the world have to face. Unfortunately, most of the people don’t have a clear understanding about it. As a result, they are subjected to a variety of negative health effects in the long run. 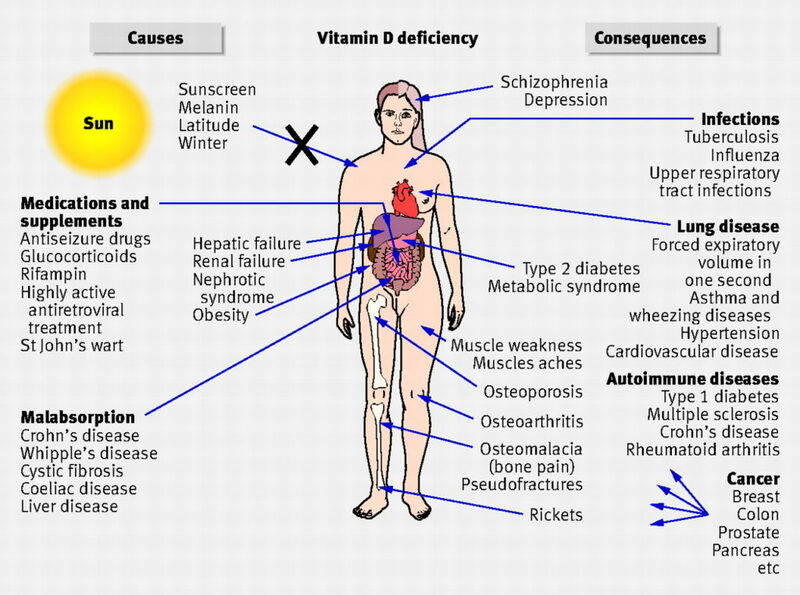 Here is a list of few common symptoms of Vitamin D deficiency that you should never ignore. If you notice these symptoms, you will have to take necessary steps in order to increase your Vitamin D intake. Out of Vitamin D symptoms, muscle weakness can be considered as the most prominent one. It comes in the form of body fatigue. If you are experiencing body fatigue than before, you should keep in mind that there is a high possibility for you to be a victim of Vitamin D deficiency. Pain in the bones can also be considered as one of the common symptoms of Vitamin D deficiency. This symptom is more prominent among adults when compared to children. That’s because the bones of adults don’t grow when compared to children. As a result, Vitamin D deficiency can lead them towards osteoporosis. That’s why you have to experience pain in your bones. Cardiovascular diseases, such as frequent clotting of blood, damaged blood vessels and heart conditions are prominent among individuals who are affected with vitamin D deficiency. This fact has been proven by a research conducted by the National Institute of Health. The symptoms associated with these cardiovascular diseases include heavy bloating in legs, dizziness and chest pain. If you are suffering from Vitamin D deficiency, more than 2,000 different genes in your body will be infected negatively. Therefore, you need to take necessary steps in order to enhance the immune system of your body. That’s because your immune system will get weak and you will be more susceptible to diseases. There is a strong relationship in between infertility and vitamin D deficiency as well. In other words, Vitamin D deficiency can lead a girl towards polycystic ovary syndrome. This can be considered as one of the most prominent reasons behind infertility. The symptoms of POS are easy to understand. If you are a woman affected with this health condition, you will be able to see dark velvet colored patches on top of your skin. One of the most devastating negative effects linked with Vitamin D deficiency is depression. Vitamin D plays a major role behind the functionality of your brain. In other words, Vitamin D produces serotonin within the brain, which is one of the neurotransmitters that aid the overall functionality. This can create an impact on your levels of happiness. When the production of serotonin within the brain fails due to Vitamin D deficiency, you will not feel any happiness. As a result, you will be subjected towards depression in the long run.